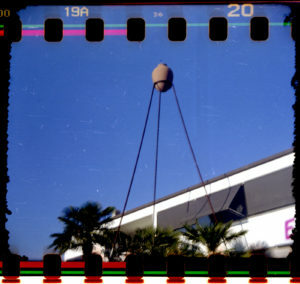 With FAKMATIC it’s possible to shoot 35mm film with Instamatic cameras. FAKMATIC is a reusable cassette that replaces 126 film cartridges which are almost impossible to find, often undevelopable, and always expensive. FAKMATIC comes with detailed instructions that will guide you step-by-step into loading the 35mm film into Instamatic cameras, taking photographs, respooling the film for development. With 135film in a ‘FAKMATIC camera’ you’ll get square photographs. The number of photos varies with the lenght of the mounted film. A 24 exposures film will hold 16-20 frames, depending on the winding mechanism and needle tighness (more on this in the detailed section of this page). It is recommended to use a 24 exposure film because a longer film will hardly fit in the cartridge. SKIP THE READING, WATCH THE VIDEO! If you don’t want to read long instructions or need to see how to accomplish all the different steps, see a video-tutorial explaining the three different processes: 1) loading, 2) shooting, 3) respooling. Take a 35mm film, cut it straight at the end, and tape it to the take-up spool. Keep the spool’s interlocking end upwards. TURN OFF THE LIGHT: from now on you must work in total dark. Pull the film out of the canister until the end and cut it. (but leave 2-3 inches of film attached to the canister for respooling). Roll up the film and make a very compact reel, it must be as thin as possible. Insert that reel into the smaller space, and the spool in the larger space. Be careful when inserting the film in the central part: the slot around the framing area is very narrow. Even if the cartridge is closed, it still has light leaks. Load it into the camera and close its back. TURN ON THE LIGHT. Now the fun part. Instamatic cameras were made to be easy, very simple, often without any settings. You would just point, shoot, crank. BUT, the old 126 film had strange perforations on the top side, with one registration hole per image: a needle entering into the frames’s hole blocked the film and armed the shutter. 135 film have completely different perforations, so the the needle will stop the film before it reaches the right position for the next photo. To avoid overlapping exposures, you have to take a black exposure (covering the lens with your hand) after every proper photo. Note that the frames will not have a consistent placement: some will be more distant, others may be very close. In some cameras you will have to take two dark shots after one proper exposure. Also note that the 35mm film’s bottom perforations are inside the framing area: your photos will have sprocket holes at the top. When the film is finished you have two options. Spool it on to a developing reel! The developing tanks are easy to load and are light-proof. You can leave the film in there for later development. This option is the easiest if you develop your own film and you have the tank with you. Respool the film into the leftover 135 film canister. This is a good option if somebody else is developing your film and you have to provide them a 135 canister for development. If you choose to respool the film into its original canister, follow the next instructions. The next operation must be done in total dark: your exposed film will be out of the cartridge until this procedure is finished. Prepare a strip of adhesive tape. Open the FAKMATIC cartridge and take the film out. Tape the end of the exposed film to the other film that comes out of the canister. Start slowly and make sure that the taped part enters nicely into the canister. Help it go smooth by gently pushing it with your fingers. Keep on spooling until all of the film is into the canister. Take the film to the lab for development. Explain that it’s not a normal 35mm film. Also, tell the lab people that part of the exposure is in the sprocket holes zones, in case you want them to scan or print it for you. OPERATING CONDITIONS. The Camerhack adapters come as-is and without warranty. Use at your camera’s risk. If your camera has not been used for a long time, check that it’s still in good working conditions: no rust, or dry grease, or dust, or dirt… The feed mechanism in cameras that were left unused for a long time could be very tight and cause a strong tension on the spools during the film advancement. Make sure that the mechanisms are properly lubricated before putting the camera back to work!